Today we're excited to chat with Amalie Jahn author of The Next To Last Mistake. Read on for more about Amalie, an interview, plus an giveaway! Meet The Next To Last Mistake! Tess Goodwin's life in rural Iowa is sheltered and uncomplicated. Although she chooses to spend most of her free time playing chess with her best friend Zander, the farm-boy from next door, her skills as a bovine midwife and tractor mechanic ensure that she fits in with the other kids at East Chester High. But when her veteran father reenlists in the Army, moving her family halfway across the country to North Carolina, Tess is forced out of her comfort zone into a world she knows nothing about. Tess approaches the move as she would a new game of chess, plotting her course through the unfamiliar reality of her new life. While heeding Zander's long-distance advice for making new friends and strategizing a means to endure her dad's imminent deployment to the Middle East, she quickly discovers how ill-equipped she is to navigate the societal challenges she encounters and becomes convinced she'll never fit in with the students at her new school. When Leonetta Jackson is assigned as her mentor, she becomes Tess's unexpected guide through the winding labyrinth of cultural disparities between them, sparking a tentative friendship and challenging Tess to confront her reluctant nature. As the pieces move across the board of her upended life, will Tess find the acceptance she so desperately desires? When I began writing The Next to Last Mistake my intention was to pay tribute to one of the most powerful forms of love I’ve ever experienced—the serendipitous bond of friendship between a group of young women coming of age under a unique set of circumstances. Although Leonetta, Tess, Alice, and Summer are fictional characters, the friendships they portray are not. After relocating from Maryland to North Carolina in my early twenties, my husband’s unexpected deployment during our first months together at Ft. Bragg came as a devastating blow. At the same time, three coworkers at the elementary school where I taught found themselves similarly upended, and the four of us quickly became family. As one of the few white teachers in a predominantly black school, the type of interracial friendship we shared was the norm, but it’s not hyperbolic to say that the grace and wisdom afforded to me by the incredible black women at LBES forever changed my life. Our friendship inspired the story. Asking me to pick my favorite character would be like asking me to pick my favorite friend which, of course, is impossible. So, if I can’t pick one of the girls, I think I’ll pick Tess’s dad. I’ve written a handful of books with dreadful fathers, but mine is truly wonderful so I wanted to put a little of the relationship I had with my own dad when I was a teenager into this book. My dad was always someone I could confide in and look up to. I love that Tess has someone on her side no matter where she goes. Oh, the novel came first, for sure. I struggle with titles and usually need to really get into the book before the title presents itself. 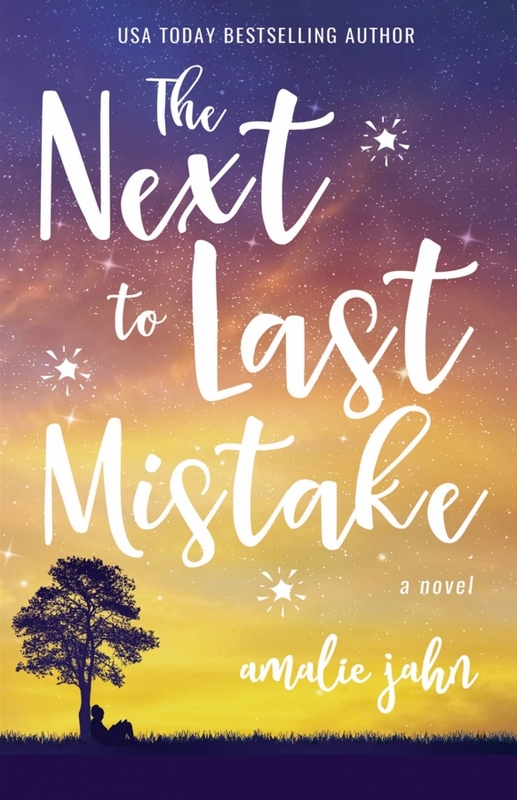 The book actually had a different title when I first began the submissions process, but I love The Next to Last Mistake because I think it speaks to the overarching theme of the book but still leaves you wondering just what the story will be about. Please don’t ask me to pick just one! I love the scenes on the farm, in the barn with Sunshine and the rest of the herd because there’s something magical about this strange friendship Tess has with her cows. I also love the glimpses we get of Tess and Zander’s relationship throughout the book before she’s forced to leave him behind. And I loved writing the scenes where Tess is uncomfortable in her new surroundings, struggling to get things right because they forced me to really dig deep and examine my own shortcomings—the things I got right and the things I could have done better. Oh my gosh, so many things. But if I have to pick just one, I think the most important thing is the importance of community. Being an author is such a solitary endeavor. When I began, I had no idea how much I was going to need other people in the writing community for so many things—advice, support, critique partners, beta readers, friendship… the list goes on and on. At first, I thought I needed to go it alone and figure it out myself, but then I realized there were lots of other authors out there who were as lonely as I was. Connecting with them has made all the difference. I love how it represents both a sunrise, which would be a beginning, and a sunset, which would be an ending. The book is about both—beginnings and endings—and how there’s beauty in both. This is such an unfair question because my TBR pile is about 150 books deep right now! If you’re gonna make me pick, though, I’m gonna go with Opposite of Always by Justin A. Reynolds. Lord knows I’m a sucker for a time-traveling teenager!! My YA contemporary about a New York City teen with germaphobia, Phoebe Unfired, is on submission to publishers, which means I’ve got a lot of waiting ahead of me. While I wait, I’m drafting another one about two sisters who go on a road trip together in an attempt to mend their broken relationship. I tend to enjoy revising more. My first drafts are typically half-a-step about garbage. LOL! I draft light, just getting the ideas down, and then go back and layer in the details which is the fun part for me, bringing it all to life. Still, because I’m such a pantser, the fun part of drafting is not quite knowing how it’s all going to end up. I have two, actually. I can put together Ikea furniture like nobody’s business. And I can also stress about things that aren't on anyone else's radar. It's really a gift. As one of the smaller parcels in our area with just under 120 acres, the entire western perimeter of our farm runs along Zander’s property line, which is nearly triple the size of ours. Because of its larger scale, his farm includes a sign and a moniker—Robert’s Farmstead Dairy—while ours remains a nameless entity. The point at which the properties meet is marked by a lone, sprawling bur oak, sixty feet tall and visible from both of our houses. Mere proximity isn’t what brings Zander across the barren cornfield to where I’m perched among the lowest limbs this morning, though. “It’s freezing out here,” he calls from below, craning up at me with his hand at his brow, shielding his eyes from the morning sun. Instead of venturing a reply, he begins climbing the tree, scrambling to the same branch we’ve been sitting on together since we were tall enough to hoist one another up. He pulls me closer, wrapping me into the folds of his coat, and I can’t stop myself from molding into the hollow of his chest. It would be better if I didn’t need him so much, but he’s a habit I’m not inclined to break. I hadn’t considered my improved proximity to the beach. I’ve never even seen the ocean before. I envision the two of us walking along the beach together, dipping our toes in the frothy surf. As pleasant as the image is, everything about it seems wrong. We don’t belong there. We belong here. On the farm. Milking cows. In Iowa. “Do you even have a proper bathing suit?” I ask him. “I have cut-offs,” he says with a shrug. I smile. The idea of him swimming in the ocean is ridiculous, even if he could pass as a surfer with his shaggy, sandy hair. He dated Gabby Landford through most of our sophomore year, and she was chatty. Refused to text and called him every night at eight o’clock to talk for at least an hour about ‘nothing.’ Zander’s words, not mine. By contrast, he and I never talk on the phone and barely even text—only enough to coordinate driving arrangements or confirm homework assignments. All our communication is done in person. That is, until after Christmas, when there isn’t going to be any more in person. “Oh, and you’re gonna have important stuff to say to me?” I hope my sarcastic tone masks the desperation in my voice. If our long-distance conversations feel compulsory, he might opt out the way he did with Gabby. Being cut out of his life is not an option. My heart will not allow it. I try to imagine what talking on the phone with him will be like, but my brain gets stuck on the semantics of your farm because it clearly isn’t going to be my farm anymore. Or ever again. And if I don’t live on the farm next door and I don’t have the same homework and I’m no longer a member of the same chess club, how long will it be before Zander and I don’t have anything to talk about anymore? I turn to face him, struggling to keep my balance on the branch. He isn’t smiling, but his eyes are warm, and I reach out with my finger to trace the scar cutting across his temple through his left eyebrow—the only remaining physical evidence of his fall from the silo when he was eleven. For a farm boy, he certainly has a way of knowing the right things to say. Cool cover and amazing story. This looks like an amazing book. I look forward to reading it! The cover is beautiful. The synopsis sounds emotional and intriguing. The cover is bright and really pops. The story sounds interesting and engaging. I like the colors and design of the book cover. This sounds like a good story of change and new challenges.